So… you ever have one of those dining experiences in which a particular food was so bad, it created a craving for a better version of that food? ****** just did that to me today. We went over today for a visit and to run an errand for her. She had some short ribs marinating for a bbq (I know, I know, it’s grilling, not a bbq) tomorrow and gave us some to cook at home. We got home and I could already smell that the beef was beyond prime. Dutifully, I broiled them a little longer to kill off them buggers, but to no avail. We all tried eating a piece, and then we moved on to better things… like dessert. They tasted like they’d been sitting in the fridge since Monday. All along, the only thing I could think of was the heavenly kalbi you made for VBS. So now I’m bugging you for the recipe and I will not let you rest until I get it. =P You can place all the blame on ******. This killer kalbi recipe was given to Annie by our Pastor’s wife Sandy who, besides being a great friend and role model, is also an excellent Korean cook. Rinse the ribs, pat them dry, and place them in a pan or dish large enough to hold all the meat and then some. 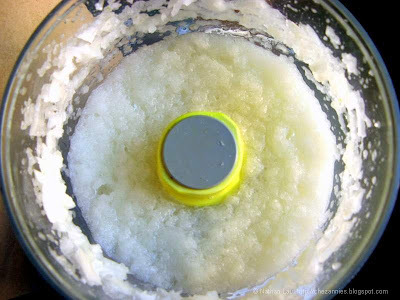 Puree the onion in a food processor until it is almost liquid. Pour the grated onion over the beef and add the honey (we used 7-Up instead). Turn each of the ribs so they are all coated. Let sit for 2-3 hours to tenderize the beef. Drain the pre-marinade liquid. You don’t have to scrape off the onion solids but just get rid of most of the liquid. Mix all the ingredients together in a bowl, then pour over the pre-marinated kalbi. Marinate ovenight. Annie prepared the kalbi days ahead of time, so she put the short ribs in a large oven roasting bag, poured the kalbi marinade over the ribs, and put the roasting bag in the freezer. The day before she was going to grill the kalbi, she took the bag of kalbi out from the freezer to thaw and finish marinating. Preheat your grill to high and clean the grates. 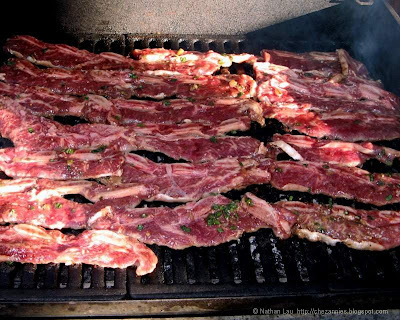 Grill the kalbi very quickly, no more than 2 minutes per side. Remember, these kalbi are very thin, and your grill is very hot. They will overcook easily and can turn from a mouth-watering, tender piece of beef into a tough, dry, burnt piece of jerky in a minute. It’s okay if the meat is still a little pink in the middle. It’s not okay to get distracted and forget to keep an eye on the kalbi. Be careful! I call this a “killer” kalbi recipe because after you’re done eating, all that’s left will be a pile of bones. Many people have told us, and I agree, that this kalbi recipe is better than the kalbi you can find in most Korean restaurants. 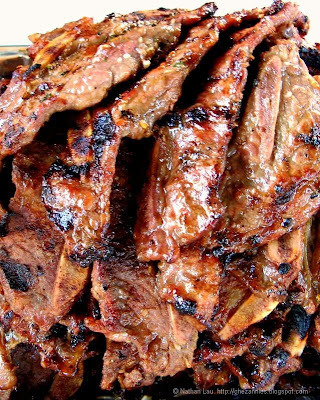 So try this kalbi recipe out for yourself and tell us what you think! This recipe was entered in the Monthly Mingle – Grill It! event. >7-up works well, my full korean mother-in-law insists that a can of Dr. pepper is the best way 2 go. i just trippin that you even have to put soda in. awesome recipe tho…. >@Anonymous – some pre-made marinades can be good, but nothing beats homemade! AWESOME! 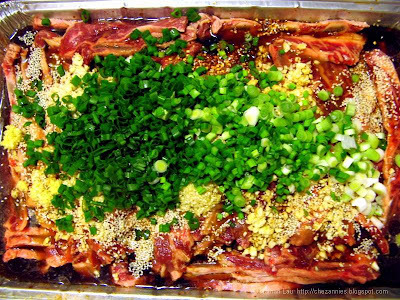 I was friends with a family of Koreans and their Kalbi was a closely guarded secret. This recipe is equally as good as theirs, my wife loves it. I would recommend the thin sliced or Asian style short ribs primarily because they contain less fat, causing less flare ups on the grill. Any ideas for sides for this? I do some pickled cucumbers but honestly I like these so sides is not an concern. Definitely kimchi. Maybe some beansprouts. Are there any boneless cut of Korean short ribs? I would like to try this but I do not have a grill. Wonder if I should buy a grill pan use over the stove top, do it in the broiler, or pan fry. Hate to buy another pan and takes up room if I only used it once in a while. Any suggestions? Thanks. So I’m making this for tonight’s dinner. I just finished marinating my meat at this early hour!!!!! I decided I wanted to bbq and marinate my meat before hand since I really never do, so wish me LUCK!! ^_^ I’ll let you know how it goes!!! Thank you so much for publishing your Kalbi recipe. 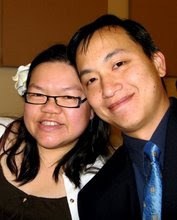 We just had a party for our wedding reception and everyone loved Kalbi short ribs so much. I baked them in the oven because I was making such a large amount of meat. I can’t wait to make them again and to grill them as intended. This is such an easy recipe and mouthwatering goodness. Just as you said, what’s left is a pile of bones. Once you started to devour these, you cannot stop. I’m starting to sound like a carnivore now, which I am indeed ^^ Thank you so much for sharing. Your site is so inspirational to me. One question though: this uses onion to tenderize meat, some other recipes use korean pear. Does it make a difference in flavor? McMillan’s famous bbq’d short rib recipe! 2 25 oz cans of sapporo beer for the chef………..enjoy! I want to make the McMillan’s Famous BBQ. Would love to have your recipes I love Korean food from Hawaii. I live in CA and would need to go to Marukai (1hr away) to get the stuff. This is Kalbi looks ono. SWIFT Theme by Satish Gandham. 59 queries in 0.722 seconds.